This is part 2 of our powder bath series. You can read more here: design, why we added a powder bathroom. One of my favorite parts about designing the Porch House powder bathroom was that it was dark and small. I know, I know! Those are not exactly the words that come to mind when you're thinking about favorite architectural features, but here's the thing. Small rooms can handle bolder patterns. They excel with darker, cozier colors. And small bathrooms are the perfect place for experimentation in design because it's not a room that you're looking at all day long (unless you're potty training a toddler ;). At the Porch House, I selected this wallpaper from Farrow and Ball as the main focal point of the design. I went with navy because it was one of the three colors I used in that house - yes, just 3 colors for 2000sf - and the pattern felt traditional yet interesting. The traditional bit was key because the house was earmarked for resell so we wanted to make sure our finishes had wide appeal. 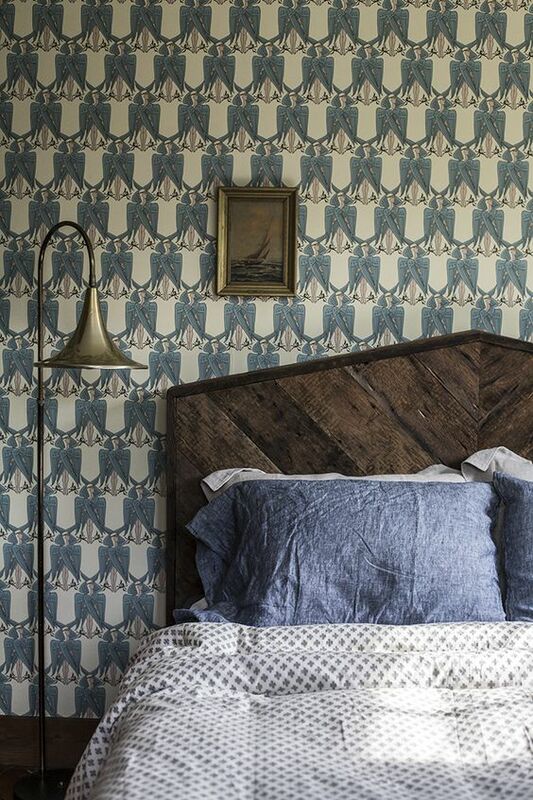 Tip: when picking out wallpaper, make sure you love to stare at the pattern. Tape a sample next to your computer or above your kitchen sink. If you find yourself getting lost in the print, staring at it for unknown lengths of time, than it's a good option for your home. Loving a wallpaper pattern is good too, but love fades and taste changes. Whether or not you find a pattern interesting has more staying power. Plus, if the wallpaper isn't interesting to look at, just save yourself a whole bunch of time and money and paint the room. With that sentiment in mind, I've rounded up eight great wallpaper patterns that could live large in the small confines of a powder bathroom. For the record, I haven't ordered from all of these companies, so don't have any feedback on that. But I love that some of these prints are reproductions from folks like William Morris. And one note about coordinating paint colors: white is always a great option, but I paired a warm neutral trim color with our navy wallpaper at the Porch House and it looks so much better than white ever could have. So don't be afraid to step away from white (ahem, Cathy!) and try something new once in a while.